I've had this wallpaper sitting in my inbox for ages but today I finally got around to posting it. Check out more wallpapers here. Yep, I finally have got around to posting the second version of tnk's awesome fake map. This one has taken ideas from all of the community, and put them all into one super-map that is the most accurate with what we know so far. tnk has watermarked this version from the start, and there is also a very handy copy detection system that is just about impossible to get through. Anyway, this is the most accurate fake map on the info we know, so enjoy, and be sure to give tnk credit. 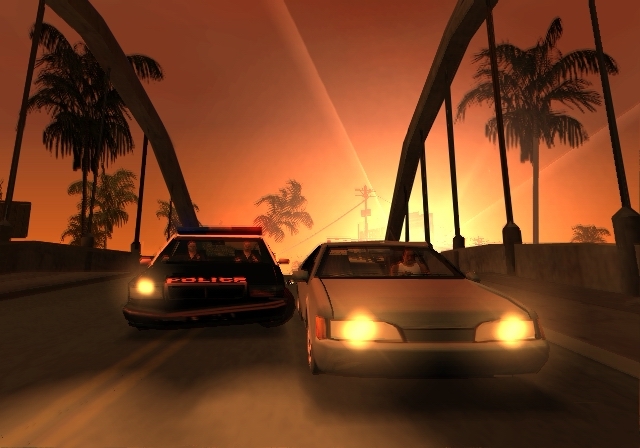 If your tired of waiting for San Andreas then why not take part in our ad campaign. The Hype Council is currently promoting Toyota's 'Put it in Play' campaign and there are some cool flash games you can play on their website, just click on the image below or or the banner in rotation above to get there (you'll be supporting us too). 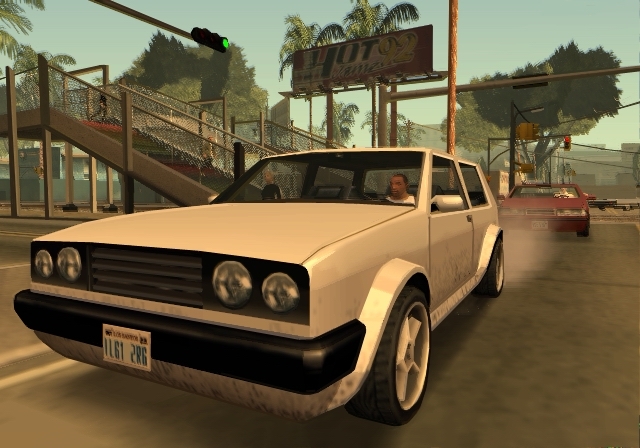 you can sure waste a lot of time playing these games and make that wait til San Andreas go a little bit quicker. Have fun! 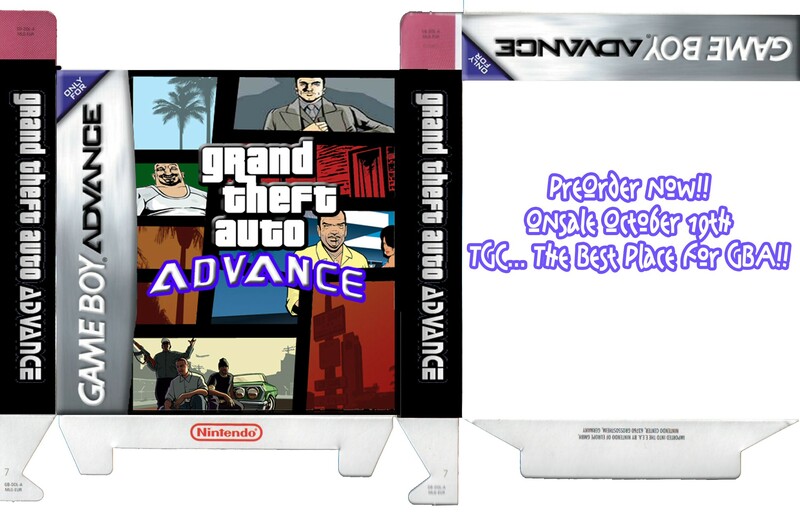 Following the news of the release date of GTA Advance, Dale Massey has created some fake boxart for the game and it looks pretty good. He has even made a full version which you can print out and make the box for it. If you would like the whole box which you can cut out, Click here to get it, its already at the exact size so just print it out and cut it out. A little message in my inbox today was informing me to check out two webstes, and sure enough they are both teaser sites for San Andreas - Finally! 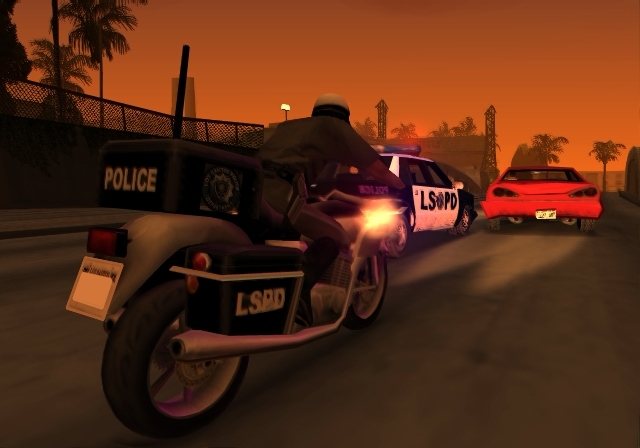 Very strange content on here, if you visit the Testimonials page you will see quotes from previous gta characters, including Jezz Torrent from Love Fist and people from Carcer and Liberty City, its great how Rockstar tie in all their previous work. 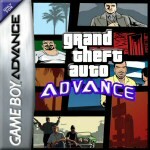 Gamespot and Nintendo have confirmed the release date of Grand Theft Auto Advance. Coincidentally it has the same release date as San Andreas - October 19th, Rockstar seem to be keeping quiet about this one like they did for a while with San Andreas. We'll have more info on it as we get it. PSM2's latest mag confirms a lot of information on San Andreas, i'll try an dpost it all here. This is all 100% confirmed by them, they had a hands on preview of a playable demo. Some of it we already know but i'll post it all anyway. I've basically picked out all the important stuff. it doesn't make your better performance wise but it will boost up your respect meter, although the Nitrous can be activated by pressing X and O. One of his missions 'The Da Nang Thang' involves freeing some immigrants trapped in a tanker by the bay. "Their priority is the fans... They love reading message boards and getting feedback." There are loads of screens in the mag sogo out and buy it (�3.99) im not sure which ones are new but i'll post them later maybe. San Andreas PC version for preorder? 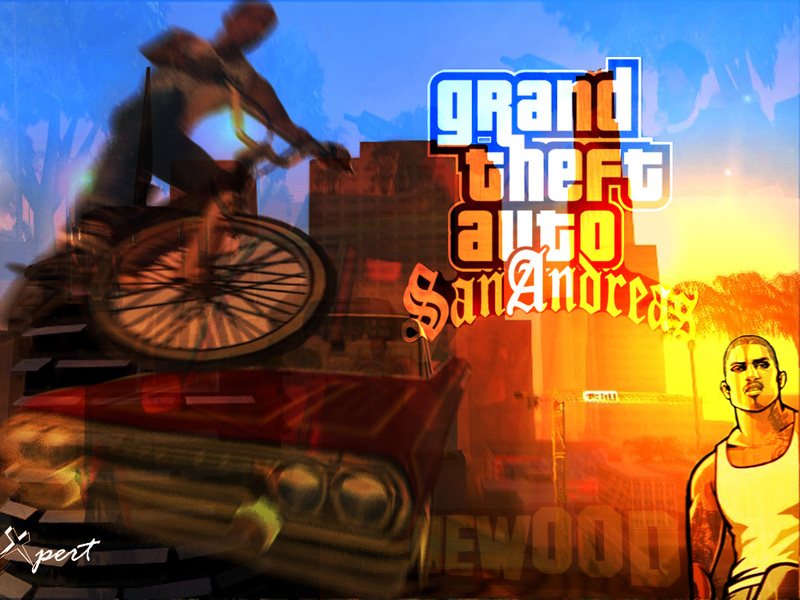 Whilst shopping around online I was pleasantly suprised when I found one shop having GTA San Andreas PC version for sale, with a release date. According to SpecialReserve the PC version is due for release on February 1st 2005 which I myself think is wrong because the PC version usually comes out later than that. Anyway here is the link http://uk.special.reserve.co.uk/q_JL5307_g...eft_auto_s.html, they're selling it for �24.99 (About ) which is usual for a decent PC game. I assume this is just a presumption of when they think it will arrive but its interesting they have a release date. Sitting in my inbox today I found a non-expected, but great email from someone calling themself tnk. This tnk said that he looked around at all of the rough map sketches that various magazines had drawn, and created his own, taking small ideas from all the others. 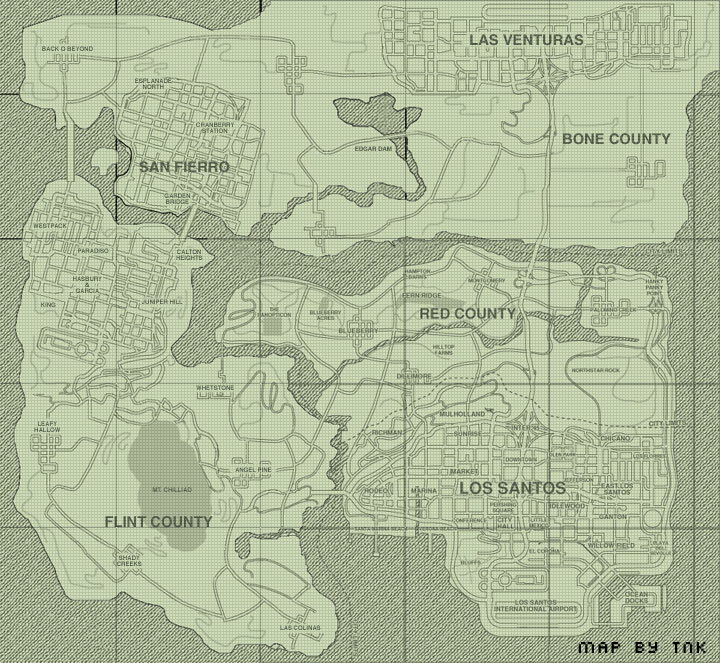 Add to this the fact that the town of Blueberry is supposed to be situated in the center of the map. All of this together leads to the following, which I think is one of the best and most accurate fan map drawn on the new info released. Goto the Fanart page or just click the following image to see this map. 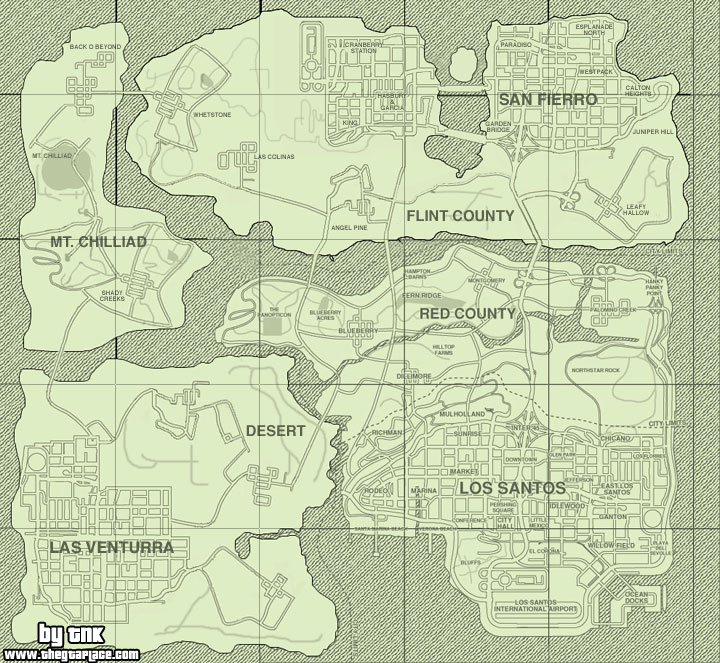 We've worked really hard to make the San Andreas site as great a destination as it could be, and we would really appreciate it if you could help us out to ensure people go to the site to see these assets as they were meant to be seen - in the proper context, resolution, display and experience. Well done Rockstar. They have updated the official website and its awesome, theres some high quality versions of the trailer, some news screens, maps and loads of new art. Later I will probably add the screens and videos to the site. Rockstar reassured us last night that a trailer would be released on MTV later and it was. It is available to watch on the MTV website here. 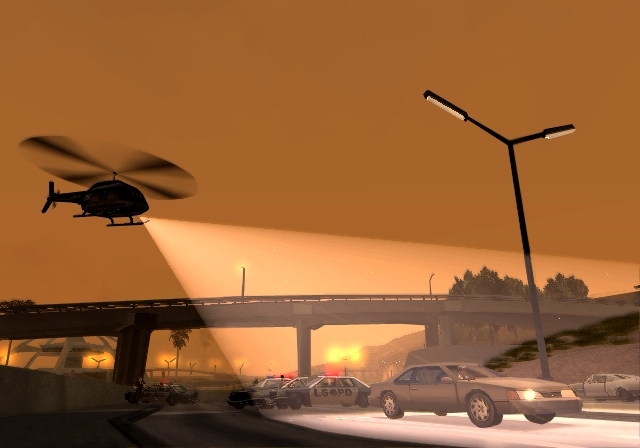 Also, be sure to keep an eye on http://www.rockstargames.com/sanandreas. so maybe the trailer will become available or maybe even a whole site update kind like vicecity.com has, with the Flash stuff. That would certainly be nice. On tonights "On the Spot," Gamespot's weekly live gaming show, Nancy Bueller announced that Rockstar has set the date for the Official Trailer to be released. That day is tomorrow, and we all will be waiting on the web for this priceless gem. So, stay tuned and we'll let everyone know when the trailer is released. They have added 7 screenshots, however all of which we have seen before and are already on the screenshots page. Rockstar have sent us 5 new screens exclusive to fansites on their webring. They will be doing this each month until San Andreas is released. Theoretically only sites on the webring should have these screens. Thank you R*, i must say they look amazing. We have something very special for you this week. To show our appreciation of your continued support and hard work we have gotten you a group of 5 fansite exclusive screenshots. That's right, this is just for the fansites for the next 24 hours. We are planning to do this monthly until the release of the game so watch out for more fansite exclusives in September and October. We have added the screenshots you saw in the Gamespot and IGN articles. Thanks to Richard Kruger for sending them out as soon as he could. Check out the rest of them on our Screenshots Page. I will be redesigning this page shortly to speed up loading times and may add a slideshow type gallery or nicer viewing. 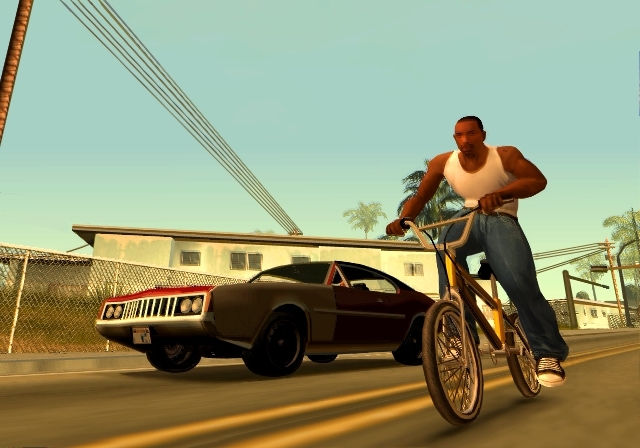 Grand Theft Auto: San Andreas is due for release on October 22nd. Check out the official trailer later this week, with more first-hand impressions and chats with Rockstar in the coming weeks. Well as you may have read, our awful host - www.ukhost4u.com had massive server problems and three weeks of MySQL data was lost. I found a 2 week old backup which we have restored but still its not good. We are looking to move to a host which actually has good uptime so please tell me if you know of one. ok but I mean that. They are hopeless. Stay away from them.